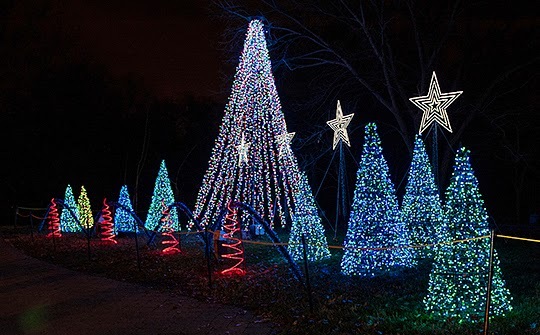 Every year the National Zoo presents Zoolights which is “free” and presented from November 28th-January 1st, excluding December 24th and 25th and January 31st. It runs every night from 5-9pm. Here’s the general gist of what I’m about to say. The lights are pretty- but plan to have really disappointed kids if yours are animal lovers, and be prepared to wait in some serious lines. We went on Saturday, December 1st (the Saturday after Thanksgiving). The smartest thing we did was arriving at 4:30pm. The parking lots, which are $20/car, were already starting to fill up and the “sledding” was already going. We purchased the ticket “sheets” so our kids could participate in the zoo tubing, train, and carousel. The kids went twice down the hill when we first purchased our tickets, and when we came back later, the line was so long they decided they’d rather just go to dinner and we ended up selling our extra tickets to someone else. We spent two hours getting up to the elephant trail from the entrance nearest the parking lot we were directed to, and after that the kids had enough. We never made it to the train or to the visitors center, so those could potentially be really cool. As you’re walking, there are displays of lights all over the zoo. This one “dances” to music, which is cute. The small mammal house, great ape house, reptile discovery center, think tank, and kids farm are open, which are a nice respite from the cold, but don’t expect to see tons of animals. We explained before we got there that the animals would not be the main focus, but we still had some really disappointed kids. The turtles are very active at night- so that’s cool, but the think tank was empty, the snakes were sleeping, and if you’ve got an animal lover, this is NOT the time to go to the zoo. We had 5 kids with us, and 4 of them just wanted to see the animals because we were at the zoo. They liked the lights, but they like elephants more. By the time we got back to the entrance we came in, the crowds had gotten pretty substantial, as I mentioned. You’re going to have better luck if you want to ride things if you get there on the early side. It wasn’t completely ridiculous but I’d guess about a forty minute line for the tubing, and really it wasn’t cool enough for that. I’m glad we went and saw the lights, but I don’t see this becoming a family tradition for us. 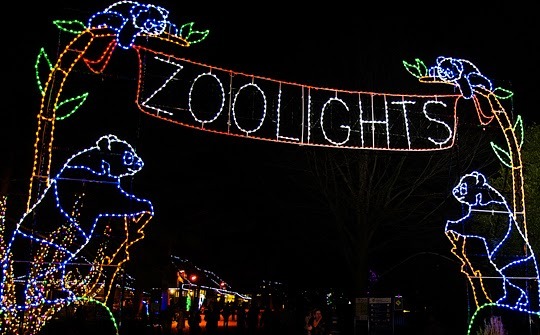 I know that some of you absolutely adore Zoolights, though, so I look forward to seeing your tips and tricks on Facebook. Don’t go if your child will get upset at lack of animals, do go if you like walking around to look at lights! Don’t forget your hat and gloves. Best tip: Arrive early and hit the rides first to avoid longer lines around 7-8pm.